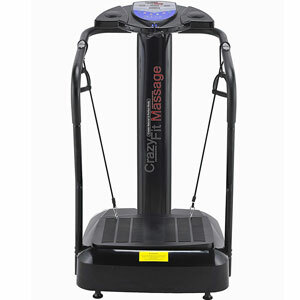 This Bluefin Crazy Fit Massage Vibration Plate can provide a good session with some helpful extra features. 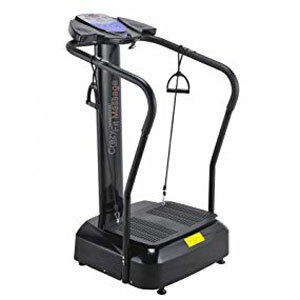 The first place to start when discussing the advantages of this machine is with the workout provided. One of those upgrades for 2017 that is so heavily promoted is the use of a new motor with 3900 watt peak output. This should mean less noise, which is encouraging in these wobble machines, and a better workout. Bluefin also promise that 10 mins on this machine will equal an hour in the gym – but this depends on intensity and the workout chosen. There are 180 different vibration levels to choose from and additional features to help with a more diverse and intense workout. The most helpful of these is the use of the resistance cords. Then there is the enjoyment of the workout, with the ease of use of the features and settings, as well as the built-in music system. Users tend to agree that it is a pretty easy to use console, with its accessible display for basic data. They also like the use of the MP3 player port and overall quality of the speakers. The problem with this Bluefin Crazy Fit Massage Vibration Plate is that there are still limitations to the workout. One of the biggest problems is with the range of movement compared to other options. Some users are used to vibrate with a wide range of movements and oscillation that takes them in all directions. The disappointment here is that this one only really goes from side to side. It therefore doesn’t seem to do as much as other vibroplates that buyers have tried. Also, there are some newcomers that would like more instructions on using the machine properly. There is a workout poster, but it is minimal. Some would appreciate information on posture for example. Summary: how does this negative feedback affect the recommendation for the Bluefin “Improved” Vibration Plate Machine? The bottom line here is that while there is one major improvement to the motor that has helped a lot, there are still other improvements to make. This model does provide more power and vibration in a quieter machine. It also has those helpful bands. The newer version of the Bluefin vibration plate would benefit from a greater range of movement and information to really keep users happy. Find more reviews about the Bluefin Crazy Fit Massage Vibration Plate with Built-in Speakers on Amazon here.